continues through Sun., Nov. 24. One thing I have learned over a decade of reviewing Point Park University's Conservatory Dance Company's shows is that they rarely contain a dull moment. The 2013 version of CDC's annual Contemporary Choreographers program, this past Saturday, was no different. Fate brought former Pittsburgh Ballet Theatre soloist Terence Marling back to Pittsburgh — or at least the subject did. Of his new work "Fatum Inflictum," created for the CDC, Marling says: "The basic image to start was a door with Fate on the other side." Marling fittingly set the comedic contemporary dance work to the first movement of Beethoven's familiar Symphony No. 5 in C minor (sometimes referred to as "Fate"). Wearing T-shirts, shorts, striped knee socks and Marilyn Manson-style eye makeup, 20 dancers looking like a zombie gym class ran amok. Crouched like wrestlers and ready to foam at the mouth, the wild-eyed dancers stomped about, fell to the floor and, led by dancer Carlos Jimenez, grunted and shouted at each other in some unintelligible language. A raucous romp, Marling's wonderfully crafted work blended a frat-party spirit with fine acting and dancing. Pittsburgh native and recent MacArthur "genius award" recipient Kyle Abraham's "Continuous Relation" set a different tone. 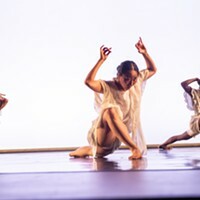 Danced to static-infused electronic music by Finnish duo Pan Sonic, the abstract work for 15 dancers utilized Abraham's signature fusion of stylized modern dance and hip-hop movement. The latter style looked more comfortable for some CDC dancers than others, but Nile Ruff was one standout; sweeping head moves, the elongating of limbs, and sharp turns flowed nicely from her. Also notable was the intense dancing of Schuyler Whittemore and Kelly Ramis. The evening's most technically polished and adroitly danced work was Brian Enos' "Whip." Set to atmospheric world music, the work began with its six dancers piled atop each other like corpses. The dancers arose one by one to drift into beautifully spaced and sharply interwoven choreography laced with rapid turns, lifts and whipping dance moves. 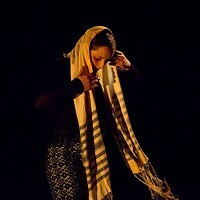 Led by the spitfire solo dancing of Vanessa Guinto, the cast performed exquisitely. The program closed with Randy Duncan's "Journey." 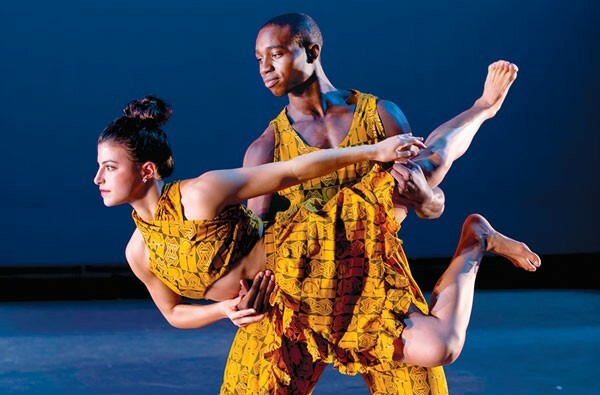 The large group work fused traditional African dance movement with contemporary styles in a crowd-pleasing piece that, like Doug Brush's music for it, built in intensity to a climactic ending.